It’s Cathy from My Book a Day. Our kids cover quite an age range (17,12, and 4) so we have to be careful with the activities we choose on vacations. It’s tricky to find something that everyone likes. We loved visiting Victoria, British Columbia so much last summer, that we are planning a return trip this summer. 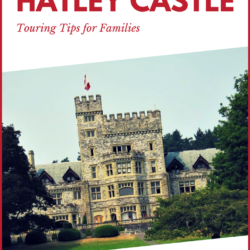 One of the activities that really stands out is our visit to Hatley Castle, which is part of Hatley Park on the campus of Royal Roads University. All our kids have mentioned that touring this castle and the gardens were among their favorite things from our first trip. Hatley Park is an amazing castle just outside of Victoria. We weren’t sure how our little guy would do on a castle tour, but this one is a really good choice for little kids. The tour is about an hour long, but it didn’t feel that long, at least partly because of the time we spent outside in the beautiful gardens. Here’s what you can expect from a Tour of Hatley Castle at Hatley Park. Plan to pay for parking. The Hatley Castle is located on the campus of Royal Roads University and all the parking lots are pay lots. You can pay at the machine using Canadian coins or a credit card. Parking is not too expensive. Rates currently start at $1 per hour. We stopped at a bank on our way to the castle to get some Loonies and Toonies (Canadian coins) to pay for parking. Start in the courtyard area to pay your fee to enter the castle. Credit cards are accepted. This building is used by Royal Roads University, so visitors are only allowed inside the castle on one of the guided tours. Check the schedule for tour times so you can tour the castle and artifacts exhibited on the courtyard level. Our tour guide showed us the rooms on the main level of the castle. She knew all sorts of facts about the history of the building, the Dunsmuir family (the original owners) and the history of the Royal Roads University in the building. We saw the dining room, the billiards room, the area currently used as a bride’s room and a room that was historically used as a bar by the college. Did I mention the stairway in the entry? Wow, I really loved that entry. I could almost picture all of the fancy guests that had been come and gone through the area where we stood. The castle is fantastic and it’s fun to hear about the history. But what what I really loved was the gardens. They are amazing! There’s an Italian Garden, a Japanese Garden and a Rose Garden, as well as a place to play croquet. Each of these gardens are unique and beautiful. I loved the pergola in the Italian garden, the beautiful bridge in the Japanese garden, and the peacocks roaming throughout the gardens add the perfect touch! It costs nothing to explore the beautiful gardens of Hatley Castle. You can visit them for free, even if you do not tour the home. Hatley Castle was a hit with my family. If you’re planning a trip to Victoria, consider touring this beautiful castle! We enjoyed every minute of our time there! Where: 2005 Sooke Rd, Victoria, British Columbia. Find Hatley Castle on the campus of Royal Roads University, about 25 minutes’ drive from downtown Victoria. When: Guided tours of the castle are available only in summer, about May through October. The gardens are open year-round. How Much: Garden access is complimentary. Here are the current rates for guided tours of the home, as of March 2018. Check the official website for current rates. How Long: Our guided tour was about an hour. You can spend additional time exploring the gardens if you like. Need a flight? Victoria has two airports – Victoria Inner Harbour and Victoria International. Alternately, many visitors (including us) reach Victoria by ferry and cruise ship. Click the button to visit Tips for Family Trips’ Air Travel page. It’s filled with ways to save on flights, and tips for making your flight with kids better. Need a rental car? Victoria has public transportation and taxis, but not Uber/Lyft (as of early 2018.) You don’t need a car to visit popular destinations in downtown Victoria, but it’s nice to have your own transportation to visit other parts of the city. Click the button to find the best rates from dozens of agencies at RentalCars.com. Need a place to stay? There are lots of great places in Victoria for families. Click the red button to check rates and availability for hotels in Victoria. We stayed in the Embassy Inn. It’s so close to everything in Victoria. We had a suite overlooking the Parliament Building. It has free parking – not all of the hotels in this area do. It also has a free breakfast made by a chef every morning. We loved it! What to Expect at Beacon Hill Park in Victoria, B.C.